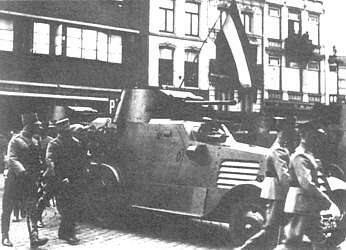 The Dutch Army decided in December 1934 to purchase modern armoured cars for reconnaissance and security purposes (*). 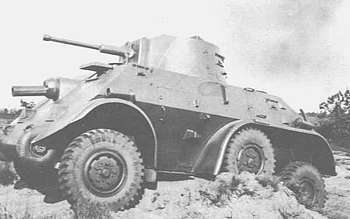 The first 12 armoured cars, the Landsverk L181 or M36 Armoured Car, were delivered in 1936.
used by the 1st Squadron. used by the 2nd Squadron. 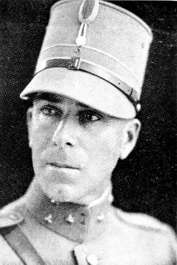 The Field Commander luitenant-general Jhr. W. Roëll preferred to incorporate the new armoured cars into the Artillery Corps because of their former experience with armoured cars. But on September 1935 it was decided that not the Artillery but the Cavalry would be enlarged with the Armoured Car Squadron. The squadron was formed on April 1st 1936. (1st) Armoured Car Squadron - 1e E. Paw. The (1st) Armoured Car Squadron (and in 1938 the 2nd too) were incorporated in the Light Brigade - later called Light Division. This was a highly mobile division of the Army with a defensive and a complementary task. The squadron was garrisoned in Den Bosch, in the Isabelle barracks. These barracks were chosen because another part of the Light Brigade - the Cyclists Regiment - was housed there already. Soon after the 1st squadron plans were made for the formation of a second squadron. In 1937 the Defense budget allowed for the purchase of a further 14 armoured cars: the Landsverk L180 or M38 Armoured Car. On June 1st 1938 the 2nd Squadron was formed. This squadron was to be garrisoned on the outskirts of Amersfoort in a new - not yet built - barracks: de Bernhard barracks (Prince Bernhard was present at the formation of the Squadron). In the meantime they were housed in the Infantry barracks. The new Bernhard barracks were officially opened on May 22, 1939. Members of the 2nd Squadron Armoured Cars just after the formation ceremony. Just like the 1st squadron, the 2nd was not complete on their day of formation. 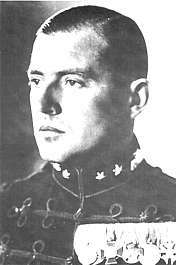 It only had 8 of the 12 armoured cars, a few motorcycles (Harley Davidsons, because the newly ordered BMW motorcycles were not yet available), 2 munition cars and two trucks. The training of recruits had not started yet, but there was an experienced staff drawn from the 1st squadron. At the end of August 1939 when the general mobilisation was proclaimed the squadron was no yet at his full standard strengh. In November 1939 the 1st and 2nd platoon of 2e E. Paw. were transferred to Barneveld and the 3rd and 4th platoon were stationed in Apeldoorn. In the second half of April 1940 they all took part in a training in the Wonsstelling (Friesland). After that the 1st and 2nd platoon went to Schiphol to strenghten the defence of this airfield. At the end of April they were relieved by the 1st Squadron and went to Apeldoorn. So at the beginning of May 1940 the complete 2nd Squadron Armoured Cars (2 E. Paw.) was stationed in Apeldoorn. The Depot Cavalry were mobilised in Amersfoort. In the beginning of September it was dislocated and concentrated: transferred to its warlocation The Hague, within the Vesting Holland. The men were billeted in the (New) Alexander barracks and in nearby schools. 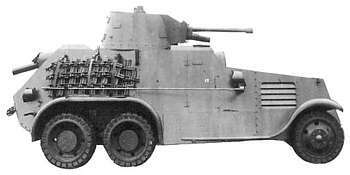 The 12 armoured cars M39 were to form 4 platoons. Every platoon was to be incorporated in a hussars regiment. Plans existed to form a third armoured car squadron and to train enlisted hussars for these platoons. Mobilisation put a stop to these plans. After the mobilisation of August 1939 the Cavalry Depot was ordered to form the platoons. Training was given with the Armoured Car Squadron of the 5th Cavalry Depot (also called Depot Squadron Armoured Cars). May 1940 eight armoured cars were in use, two of them without canon. The other 4 were probably sent back to Eindhoven for modification and repairs. (*) The information on this page is a summary of the book: 'Eskadron Pantserwagens 1936-1940', Drs. J. A. Bom, 1986. Published in memory of the 50th anniversary of the formation of the 1st Squadron Armoured Cars, April 1st 1936 - April 1st 1986.